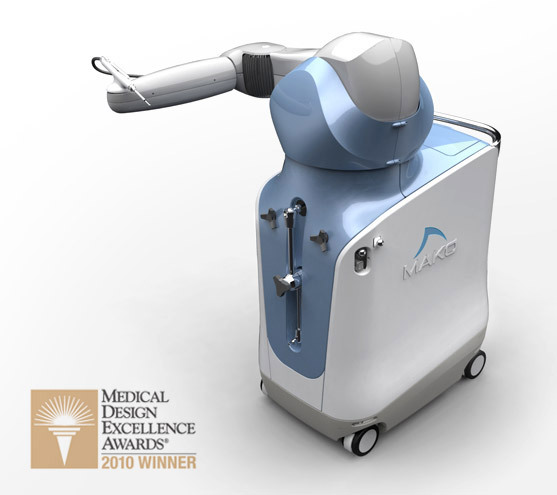 Farm’s collaboration with MAKO Surgical Corp. helped bring true product innovation to the hands of orthopedic surgeons by introducing a proprietary, interactive robotic surgical system for treating patients living with early to mid-stage osteoarthritis of the knee. The Rio® allows the physician to precisely resurface damaged areas of the knee without compromising the surrounding healthy bone and tissue. Our team focused Farm’s strategic, research-driven process on task analysis by observing live knee replacements and interviewing surgeons in an effort to simplify and refine the procedure. Early-stage mockups and subsequent prototypes then helped the team uncover greater efficiencies in the operating room, including a reduction in the number of procedure steps, while increasing operational accuracy and precision. Farm’s human factors experts helped create an ergonomic design solution that gives the surgeon complete freedom of movement and precise control of the robotic arm. At the same time, the system accommodates the size variations of users as well as patients. The result? An extraordinary minimally-invasive surgical experience with reproducible precision for every patient. An added benefit—patients can return to an active lifestyle with far less recovery time and a smaller scar compared to total knee arthroplasty procedures. Since its launch, the RIO® device initially gained FDA approval for partial knee resurfacing, followed by approval for total hip replacement, prompting Stryker Corporation to acquire MAKO Surgical Corp. for approximately $1.65 billion in 2013. In 2015, the FDA granted approval for RIO® to be used in total knee replacement procedures, further expanding its capabilities. According to Stryker officials, the company sold more than 40 of the RIO® devices in 2015, helping to power orthopedic net sales of $1 billion and further supporting claims by industry analysts that robotic surgery will account for 23 percent of total knee procedures in the next decade. 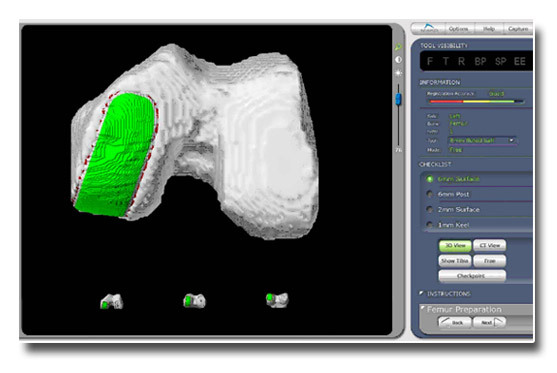 Farm's research and observations aided in the creation of the graphical user interface design for the Rio® Robotic Arm Interactive Orthopedic System. The GUI includes intuitive, sequential screens that represent single steps in the procedure, easy-to-use navigation features, and simplified displays that utilize a checklist process. This user-friendly approach guides surgeons through the procedure, allowing them to focus on surgery and conduct replacements with increased accuracy.